Jack Conan is set to wear the Ireland No 8 jersey in a Six Nations game for the first time as Joe Schmidt prepares to freshen up his pack for the visit of Italy on Saturday. Conan looks set to be joined by his Leinster colleagues Jack McGrath, Devin Toner and Dan Leavy as the head coach makes changes in each line of the scrum, but it is expected that he'll keep faith with the backline that started against France last week. 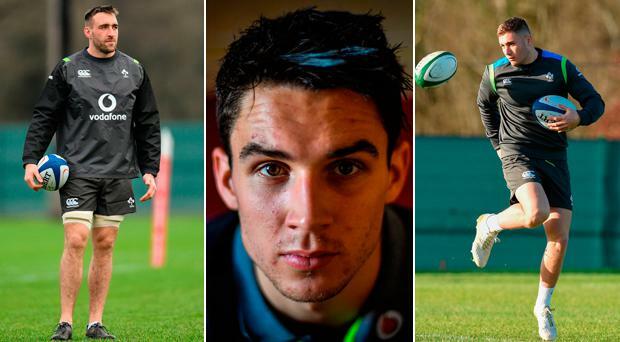 Uncapped 20-year-old Jordan Larmour is expected to be named on the bench for the clash alongside Joey Carbery and both are likely to see game-time during the second half as Ireland go in search of a bonus-point win. McGrath will come in for Cian Healy, with Toner replacing James Ryan, who is believed to have picked up an injury in the France game. Quinn Roux is set to be named on the bench. Leavy replaces the injured Josh van der Flier, while Conan gets the nod ahead of CJ Stander who will be asked to make an impact off the bench with Peter O'Mahony the only back-row remaining from the starting XV in Paris. Schmidt was always expected to make changes for the visit of Italy who are on a six-day turnaround after their heavy opening-day defeat to England in Rome on Sunday. However, he has chosen to continue with the same backline in an attempt to build cohesion and momentum into the Six Nations campaign, meaning Rob Kearney, Keith Earls and Jacob Stockdale are in the back-three, with Robbie Henshaw and Bundee Aki in midfield and Johnny Sexton and Conor Murray at half-back. Rory Best and Tadhg Furlong join McGrath in the front-row, with Rob Herring vying for a bench spot with Seán Cronin, and Andrew Porter likely to get the nod ahead of John Ryan. Roux will get the nod ahead of Ultan Dillane who is dealing with a family bereavement, while Stander is a strong, experienced option to come off the bench. Kieran Marmion may get the replacement scrum-half berth from Luke McGrath, who saw no action in Paris, while Carbery and Larmour are exciting options for Schmidt to bring on as Ireland chase a score to keep up with early pacesetters England and Wales. Schmidt confirms his team at 1.45 today, with Conor O'Shea naming his side at 1.30. Possible Ireland team v Italy: R Kearney; K Earls, R Henshaw, B Aki, J Stockdale; J Sexton, C Murray; J McGrath, R Best (capt), T Furlong; I Henderson, D Toner; P O'Mahony, D Leavy, J Conan. Replacements: S Cronin/R Herring, C Healy, A Porter, Q Roux, CJ Stander, K Marmion, J Carbery, J Larmour.